This principle is hard to ignore as weather patterns increase in intensity. Rain, wind, hurricanes and cyclones are all caused by processes that begin in the ocean. The ocean affects changes to our climate by absorbing roughly half of all carbon dioxide added to the atmosphere. 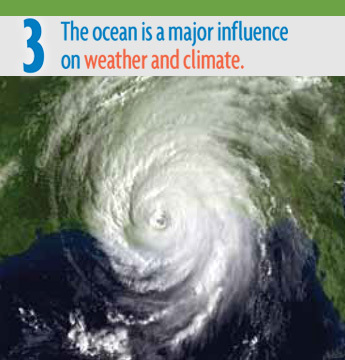 3: The ocean is a major influence on weather and climate. c. Heat exchange between the ocean and atmosphere can result in dramatic global and regional weather phenomena, impacting patterns of rain and drought. Significant examples include the El Niño Southern Oscillation and La Niña, which cause important changes in global weather patterns because they alter the sea surface temperature patterns in the Pacific. e. The ocean dominates the Earth’s carbon cycle. Half the primary productivity on Earth takes place in the sunlit layers of the ocean. The ocean absorbs roughly half of all carbon dioxide and methane that are added to the atmosphere. f. The ocean has had, and will continue to have, a significant influence on climate change by absorbing, storing, and moving heat, carbon and water. Changes in the ocean’s circulation have produced large, abrupt changes in climate during the last 50,000 years. g. Changes in the ocean-atmosphere system can result in changes that in turn, cause further changes to the ocean and atmosphere. These interactions can have dramatic physical, chemical, biological, economic, and social consequences. According to a recent survey in the journal Science, many teachers spend little time or lack the science content to effectively teach climate change. Here are some resources that you can use to teach this principle. Summit: The 2016 NEOSEC Ocean Literacy Summit focused on this principle.